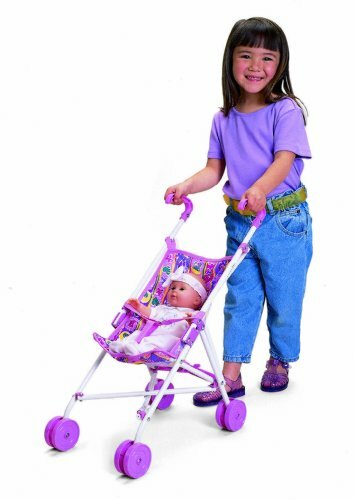 Our pretty umbrella doll stroller lets a kid follow along behind Mommy or Daddy, pushing a best-loved baby doll. Features contoured handles and adjustable seat strap; folds for easy storage. Sweet, huggable baby dolls to love and nurture complete with popular and imaginative accessories. For ages 1 and up. Whether you are looking for new outfits for your baby doll or just a new addition to your collection All About Baby dolls are sure to please. 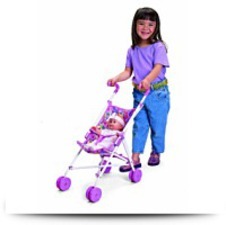 Top quality baby dolls and baby doll accessories are a should have. Color and styling could vary. Sturdy metal construction, no assembly required. Dimensions: Height: 25.75" Length: 4.12" Depth: 4"
Package: Height: 4.5" Length: 26.2" Width: 4.5"